- convert from 4mm female to 2x (two) 5mm female ORCA present the powerful capacitor for the ESC. Fitting for 1cell - 2cells LiPo and 2cell - 3cell LiFe, improve the ESC performance. multiple connectors included The ORCA professional tools, are base on the highest quality standard, to provide High precise, lighweight, long life, durable and confortable handle. 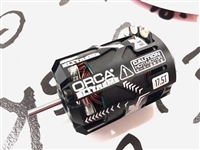 - Tip length 120mm ORCA Ultra High Speed ESC fan for ESC The ORCA professional tools, are base on the highest quality standard, to provide High precise, lightweight, long life, durable and comfortable handle. 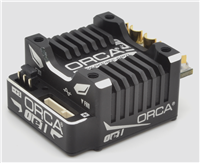 - Tip length 75mm ORCA present the new generation ESC program card, compatible new R32 ESC featuring new firmware and hardware for more updatability friendly through micro SD card to update the latest firmware of the ESC, which is do not compatible older generation VX3 ESC. ORCA present the new generation ESC program card, compatible to ORCA OE1 / R32X / B32 ESC featuring new firmware and hardware for more updatability friendly through micro SD card to update the latest firmware of the ESC, which is do not compatible older generation R32, VX3 ESC. ORCA present the new HV Generation4 6300mAh 7.6V LCG race pack, which featuring graphene element bring the batteries High Voltage power platform, high capacity of the battery pack, more power and fun to satisfy the different race conditions.